(Newser) – For more than 65 years, he has been the unwavering presence alongside Britain's longest-serving monarch, the consummate consort and royal representative. 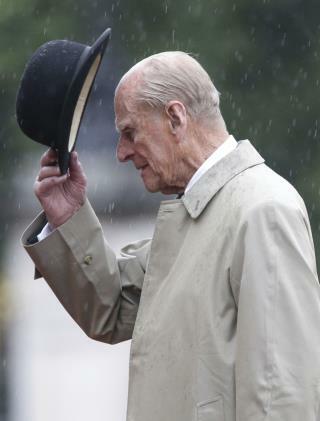 On Wednesday Prince Philip, 96, made his 22,219th—and final—solo public engagement, braving heavy rain to meet Royal Marines who have completed a 1,664-mile trek to raise money for charity, per the AP. Philip, known as the Duke of Edinburgh, will still appear at Queen Elizabeth II's side—from time to time—as the 91-year-old monarch soldiers on. Philip announced he was stepping down from public duties in May. The royal, known for his quips and gaffes, recently joked about his big retirement day, telling celebrity chef Prue Leith: "I'm discovering what it's like to be on your last legs." My word! Many cruel people on hear. Hail to him for working so long. I couldn't have done it; too much arthritis. I'm sure the queen is waiting until Charles is just too old. The Brits will lose a lot if he takes the role of king with Camilla as whatever. It would be a bad move. I remember the Queen's acceptance speech when she vowed to do all she could for the people of England and I think she has. Great woman even if you don't agree with everything. Great guy by her side. You don't see that much anymore.